Our commitment to diversity and inclusion touches every facet of our organization and we recognize that it needs to be a part of our DNA. We have fully embraced it, and are now working to embed it in everything we do - from how we hire employees to incorporating it into our core value of keeping people at the center. Earlier this year, we advanced our commitment to diversity and inclusion by creating a new position - Diversity and Inclusion Programs Manager - dedicated to these efforts. This past month, we publicly pledged our commitment through the CEO Action for Diversity & Inclusion™. CEO Action for Diversity & Inclusion™ is the largest CEO-driven business commitment to advance diversity within the workplace, and is led by a steering committee of CEOs and leaders from Accenture, Boston Consulting Group (BCG), Deloitte US, The Executive Leadership Council, Ernst & Young (EY), General Atlantic, KPMG, New York Life, Procter & Gamble (P&G), and Pricewaterhouse Coopers (PwC). The coalition represents more than 50 industries with millions of employees globally. “Making the pledge with CEO Action for Diversity & Inclusion™ is another great way for us to demonstrate we are committed to building an inclusive culture. Janney takes pride in recruiting and retaining a diverse employee population; ensuring we have an inclusive culture allows us to remain aligned with our core value of keeping people at the center of everything we do,” said Tim Scheve, President and CEO. Janney’s CEO Action Pledge is available at www.ceoaction.com. The pledge states the actions that we will continue to take to cultivate a workplace where diverse perspectives and experiences are welcomed and respected, and employees feel comfortable and encouraged to discuss diversity and inclusion. 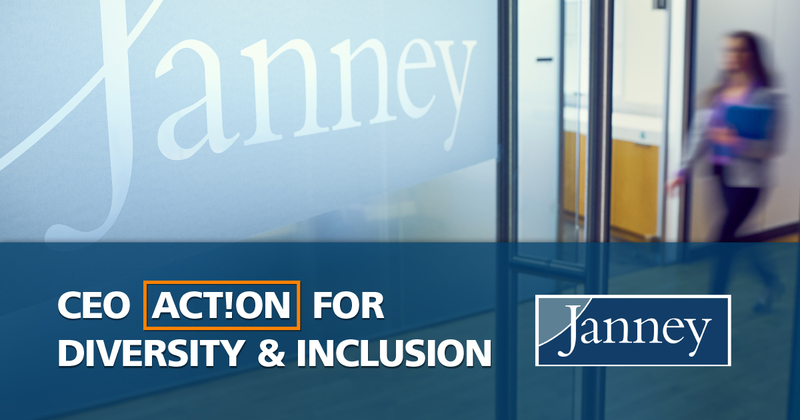 Janney also pledged to create a workplace that supports open dialogue on complex, and sometimes difficult, conversations about diversity and inclusion, in addition to implementing and expanding unconscious bias education. Through Janney’s pledge, we will have access to a database of action items - both successful and unsuccessful - that have been submitted by participating firms, providing us with valuable information and helping us improve our own best practices moving forward. “The CEO Action Pledge is a powerful top-down approach to advancing diversity and inclusion. Tim’s signing of the pledge demonstrates Janney’s vision of value in diverse backgrounds and perspectives, not just because it’s the right thing to do, but also because it helps drive business results. A diverse workforce better positions Janney for success and proves we are a forward-thinking Firm,” said Davina DeMark, Diversity and Inclusion Programs Manager.